It was around 9.30 pm I look around with my office and saw our news paper layout which it will be published next day, suddenly my news editors told me, RAB killed 5 muggers in Uttar please move on as early as possible, and maybe we lead that news. I left my office within minutes with my camera and ride my motorbike as faster to cover on the spot in the city of Uttra 13 sector near Mascot Plaza, at Sonargaon Janapath. 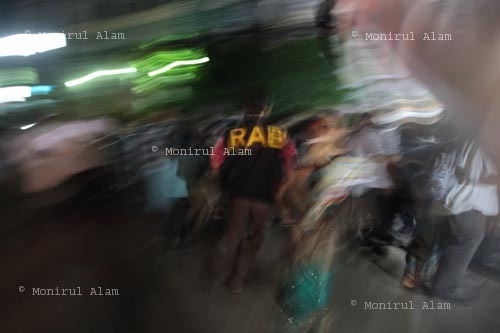 When I went there, I saw number of plane cloth security forces and RAB personals cordoned enter the area with the yellow ribbon which written “Crime Scene Do Not Cross” 4 deceased already sent to the Dhaka medical morgue and 1 rushed to local hospital and two alleged mugger arrest on the spot in Ran custody. 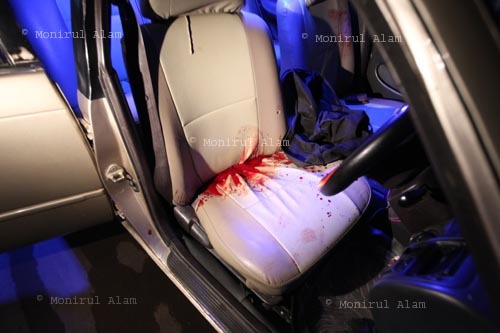 On the spot I took a picture a private car with blood spotted on the sits, broken car widows with bullet holes at the same time I took several pictures which I remarked. When I talked one witness he said, soon after fired pedestrian ran away in panic after that the law enforces cordoned off the spots and media was covered. I saw number of local’s gather and to watching the situation some time security forces try to left the scene but curious people still stand and watching. Within half an hour’s I leave on the spot and move to Dhaka Medical College to cover on 5 deceased. The road was fully rushed with huge number of vehicle some time I escape some time I stuck with traffic jam, at last I reach on the Medial morgue and covered 5 deceased. Already my news editors phoned me and they just wait for my picture which is published on the next day. . .